We specialize in buying fine wrist watches such as Breitling, Cartier, LeCoultre, Movado, Omega, Patek Philippe, Rolex, TAG Heuer, Universal Geneve, and Vacheron. 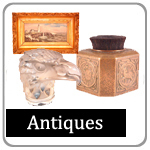 We are also always buying antique pocket watches made by Waltham, Illinois, Hampden, Tiffany & Co., Hamilton and more. 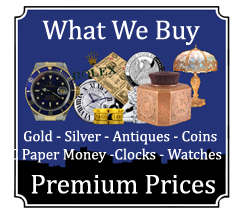 Premiums prices paid for repeaters, 21 or higher jewel Railroad grade watches. Call or stop by today. Stinson & Company has close to 20 years of experience buying and selling antique, vintage and modern Wrist and Pocket Watches. 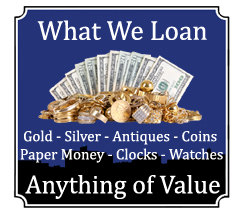 We have a built a reputation for fair and honest dealings with competitive cash buy prices. When you sell your fine Swiss Wrist Watch or Antique Pocket Watch that your grandfather gave you, there are some things you need to know. 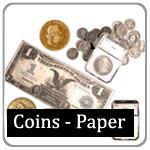 • Prior to selling your Wrist or Pocket Watch find out a current fair market value. 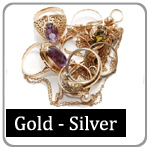 There are plenty of web sites that offer comparisons to ballpark your items value. 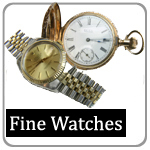 We offer free verbal appraisals and explain the current market when selling your timepiece. No Appointment Needed. 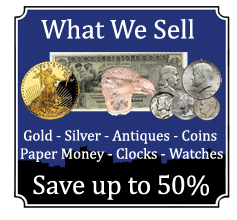 • Sell your time piece to a reputable dealer. Do your homework! Ask around, in this business your reputation follows you, so it shouldn't be that hard to find an honest and fair buyer. • Take your watch to 2-3 dealers, as many shops do not offer hard buy prices over the phone without being able to see it in person. There are too many variables in determining the true accurate value unless it is seen in person. • Make sure prices given are good for a 24 - 48 hour period to allow you enough time to shop around. 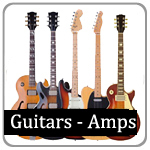 • Compare your offers and revisit the company that offered the most and treated you the best.